CTJM-1-H tubing jacket maker set turns standardCorbin-specified copper tubing into bullet jackets. In the .50 caliber sets, the tubing is first cut to lengthusing the optional Corbin SAW-1 tubing cutter saw or othermeans, and then the end is rolled over in the JM-1 die,which is also called the "End Rounding" or "Jacket Making"die. After the end is rounded over, it is then either flattenedor formed into a boattail shape using the "end flattening"punch in your existing CS-1 core seater or BT-1 boattailpreform die. 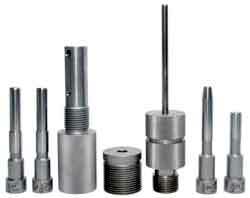 The same end flattening punch is used withvarious lengths of jackets, but a specific length ofend rounding punch (or an adjustable shoulder punch) isrequired for each length of tubing in the first step. Sizes other than .50 generally use a JRD-1-H jacket reducingdie to bring the end-rounded tube down to a diameter thatfits easily into the core seater or boatttail preformer,for base flattening. The die set also includes a propersize core seating punch. Rebated boattail tubing jacketsrequire a shouldered punch of specific length to preventthe tubing from extruding forward as the base is shaped. Shouldered punches can be fixed length, for one specificjacket length, or they can be adjustable length. Theshoulder adjusts like a micrometer barrel around the central portion of the punch.